Do you watch in envy as your fellow passengers drift quickly into sleep and don’t wake up until that final approach to your destination? If you struggle to sleep during a flight, we have put together some tips to help you prepare before and during the flight to get some z’s in before you get started on your next activity breaks. 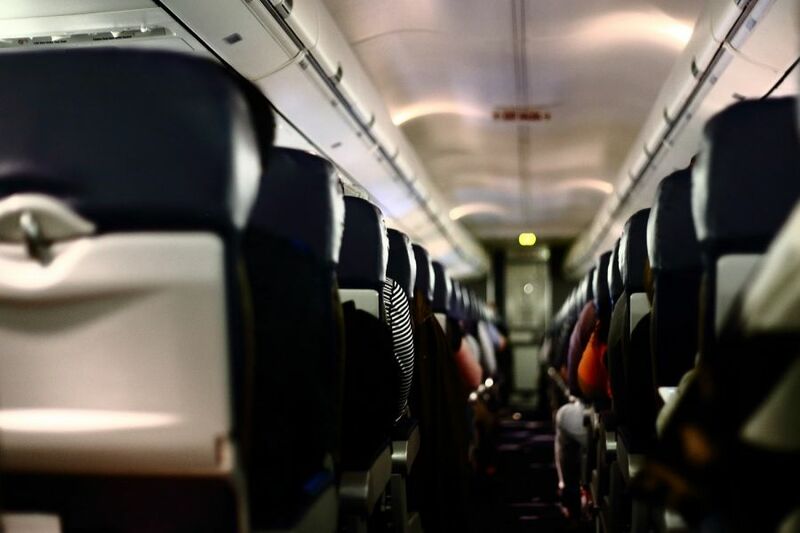 When you’re booking your flight, or if you’re checking-in online a few days beforehand, it can be really helpful to take time to consider your seating choice if you’re keen to sleep during the flight. Firstly, why not check out Seat Guru where thousands of travellers who’ve gone before you have logged their experiences to help you choose the best seat based on your particular flight and model of plane. This will help you know which seats are beside the galley (and so will be busy with the crew during the flight), which have misaligned windows (and so are uncomfortable to lean against to get a rest! ), and which might have a limited recline preventing those of us who can’t sleep upright from getting into a totally comfortable position. If you sleep on your side, we also recommend picking a window seat (if it’s a night flight!) where you’ll be able to use it to lean against depending on which side you usually lie on for some extra added support. If you’re lucky enough to get onto a flight and spot a free row, or have a spare seat beside you – then you’ve hit the jackpot! Does noise stop you from being able to drift off? If so, it might be worth investing in noise-cancelling headphones (which are also super handy if you regularly take public transport and want to drown our any surrounding conversation interrupting your music!). Two types of noise-cancelling headphones exist – passive or active. Passive headphones work to cancel the sound by the way they cover your ear, before they’re even in use. Active headphones however cost a bit more as they work electronically to more specifically drown out the noises around you when they’re turned on. While some of these can be considerably pricey, the bigger brands do often have decent models for around £50. You’ll also need to consider your listening choice for the flight – whether this is gentle relaxing music, or whether you download an app that can play soothing sounds like waves or rainfall to help you zone out. If you like to dress to impress on a flight, we recommend travelling to the airport in your comfy clothes that you plan to wear on the plane rather than changing as soon as you get into the air. Then if you need to wear something smarter at the other end, you can change into this before landing and it will look as good as if you just put it on (because you did!). Ideally, comfy sweats and a loose t-shirt or hoody are ideal for getting cosy enough to sleep. As well as this, wearing a cap can be handy as it allows you to pull the cap down and block out any of the light from within the cabin. It might go without saying but try to avoid caffeine before your flight or you might find you’re more awake than ever when all you really want to do to prepare for your activity break is get some sleep! Similarly, even if you’re a nervous flyer, it won’t help to drink alcohol. While this might relax you in the short-term you’ll have a more restless sleep and then have the discomfort of waking up with an even drier mouth than usual – as well as needing to use the restrooms during the flight! So what can you do during the flight? It’s a basic one that you’ve heard all the time, but if you’re going on a long-haul flight then be sure to set your watch to your destination’s time-zone so that you can start to prepare yourself for that with meals and when to sleep etc. As well as this, airlines are usually pretty good with serving you meals at the correct times for your destination. So even though you might get on the plane in the morning – you could be served your dinner just an hour later in order to ensure you get sleep during the destination’s night-time. Regardless of how hungry you are, it’s good to try and get into the routine of your new location. When you get into the air and are ready to sleep, you can recline your chair (hopefully if you’ve selected your seat carefully!) and relax a little. But be aware of those around you and we recommend not going the whole way back especially if someone behind you is trying to watch a seat-back TV or read or anything other than sleeping! To make sure the cabin crew don’t interrupt your dreaming, there are sometimes “do not disturb” stickers in your on-flight pack that you can stick on the top corner of your seat to indicate that you don’t want to be woken up for meals or refreshments. As well as this, it might not be the comfiest but sleep with your seatbelt on and visible above any clothing or blankets so that if any turbulence is encountered, you won’t need to be woken up to check that you’re secure! So now you know how to get some rest before you arrive at your next activity break, why not give yourself something to look forward with ActivityBreaks.com’s range of adventure holidays – you might not need any of these tips for your return journey if you’re tired out from an active holiday!